Visible in dark bedroom. .6 inch high numbers. Battery backup. AM/PM and alarm indicators. Snooze control for extra naps. Matte black finish. Top controls. For 110-120 volt AC, 60 cycle. Handsome clock radio takes up very little space on the night stand or table.Full feature- 9 minute snooze, battery backup, and sleep to music. Black color. Handsome clock radio takes up very little space on the night stand or table. Has MP3 plug so you can listen to your audio device over the speaker of the radio. Full feature- 9 minute snooze, battery backup, and sleep to music. Black color. Super bright .9'' red LED display alarm clock radio with USB charging plug for mobile telephones or iPod devices. AM/FM Radio. You can listen to your favorite music from your iPod, iPhone, or MP3 player by plugging the aux in cord into the headphone jack of your device. Dimmer switch to control clock brightness. 9 minute snooze, sleep to your favorite radio station, and battery backup. (USB cord not included). Super bright 1.2'' Green LED Display Alarm Clock AM/FM Radio. You can listen to your favorite music from your iPod, iPhone, or MP3 player by plugging the aux in cord into the headphone jack of your device. Dimmer switch to control clock brightness. 9 minute snooze, sleep to your favorite radio station and battery back-up (battery not included). One day alarm has to be reset every evening so the next guest will not be awakened by the previous guest leaving the alarm on. Dual alarm lets you set two different alarm times. Red .6'' LED display. AM/FM clock radio with battery back up (battery not included), 9 minutes snooze and sleep to music. 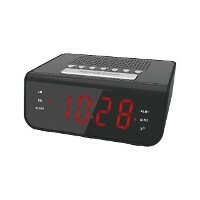 Bright .9'' red LED number AM/FM clock radio is full featured: wake up to your favorite radio station or buzzer alarm. Also listen to your favorite music from your iPod, iPhone or MP3 player by plugging the aux in cord into the headphone jack of your device. 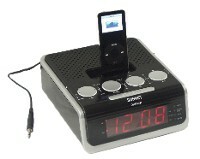 Clock radio with snooze and sleep to music. Battery backup (battery not included). 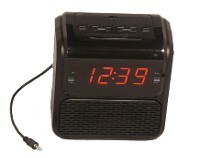 Bright .9'' red LED number AM/FM clock radio is full featured: wake up to your favorite radio station or buzzer alarm. Also listen to your favorite music from your iPod, iPhone or MP3 player by plugging the aux in cord into the headphone jack of your device. 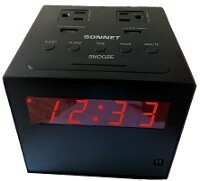 Clock radio with snooze and sleep to music. Battery backup (battery not included). Clock has 110/220 volt and 50/60 cycle switchable for international use. 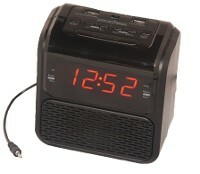 .6" LED Alarm Clock Radio. Aux in cord to listen to MP3 or iPod devices. Two Alarms. Battery backup (battery not included). High/Low dimmer. Headphone jack. Programmable CD, sleep to music and nine minute snooze. 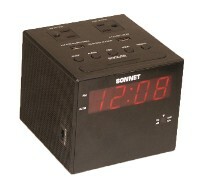 A iPod/iPhone 4 docking station clock with 30 pin plug. .9'' LED display PLL FM Digital tuning stereo radio. Aux in cord. Snooze and sleep function. Battery backup. 2 ''AA'' batteries (not included). Black with silver trim and buttons. Measures 6'' wide x 6 1/2'' deep x 2 7/8'' high.